With the evolution of games, soundtracks gained a special place in the games world. Check out the best video game soundtracks and bands. Since its first version, released for the PS One in 1999, the skateboard series that takes the legendary athlete's name has always had beautiful playlists, chosen by Tony Hawk himself. Among the most memorable bands are Red Hot Chili Peppers (Fight Like a Brave), Foo Fighters (The Pretender), Iron Maiden (The Number of the Beast), Ramones (Blitzkrieg Bop), Rage Against the Machine (Guerrilla Radio), Motorhead (Ace of Spades), AC / DC (TNT) and hundreds of other important artists. Criterion's racing series that mixes fast machines, dangerous slopes and many explosions also stands out for its excellent selections of songs played during races. Some of the most popular names are Yellowcard (Lights and Sounds), Fall Out Boy (Sugar We're Going Down), Bullet for my Valentine (Hand of Blood), Avenged Sevenfold (Beast and the Harlot) and The Doors (Break on the Through). The most obvious and stuffed game list, Guitar Hero could not be left out of any selection of the best soundtracks. The music game published by Activision secured the hours of fun for rock fans with its beautiful playlists spread across different versions. Among the best examples are classics like Kiss (Detroit Rock City), Led Zeppelin (Stairway to Heaven), Black Sabbath (Iron Man), Deep Purple (Smoke on the Water), Queen (Killer Queen) and David Bowie (Ziggy Stardust) . The new generation of the genre also has time on Rockstar simulator, with Blink-182 songs (The Rock Show), Franz Ferdinand (Take Me Out), Slipknot (Before i Forget), Foo Fighters (Monkey Wrench) and The Strokes (Reptilla). The game also had special versions inspired by some great bands like Aerosmith, Metallica and Van Halen. In addition to an extensive list of tracks of the bands, the game had faithful representations of its members. Main competitor of Guitar Hero, the game came to fight the absolute success of Activision game. The big addition is the ability to play as a full band including drums, bass and vocals, in addition to the already traditional guitar. For the dispute, EA invested high and secured some big names like Red Hot Chili Peppers (Dani California), Fall Out Boy (Dead on Arrival), Metallica (Enter Sandman), The Police (Next to You) and Beastie Boys ( Sabotage). 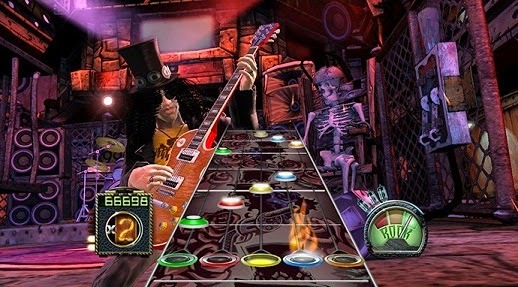 Like Guitar Hero, Rockband also won special versions dedicated to bands, with titles inspired by AC / DC, Green Day and nothing less than The Beatles. Released for PS3, Xbox 360 and PC, Brutal Legend brings the charismatic actor Jack Black (also known for his involvement with musical projects) as the protagonist of an adventure in a world totally inspired by the metal culture, with rights to fantastic creatures, mountains form of amps and guitars. As might be expected, the game has a soundtrack handpicked, bringing some of the biggest names in the genre. Among the top names are Motorhead, Ozzy Ourborne, Judas Priest, Manowar, Kiss, In Flames, Slayer, Anthrax and many other metal icons. The popular simulator crimes Rockstar has as one of its main activities the theft of cars, where players can tune various radios, which in addition to transmitting programming dedicated to the game also play songs of the time concerning the history of the game. In the various versions of the game were hundreds and hundreds of famous band music, past Guns n 'Roses (Welcome to the Jungle), Michael Jackson (Beat It), Kiss (Strutter), Who (Eminence Front) and James Brown (Funky President). The dangerous and illegal racing Need for Speed were always packed for quality music. The games usually have eclectic selections, ranging from large rock bands to important rap names. Some fine examples are Disturbed (Decadence), Avenged Sevenfold (Blinded in Chains), Bullet for my Valentine (Hand of Blood), Snoop Dog (Riders version on you Storm), The Black Keys (Lonely Boy) and Calvin Harris (We 'll Be Coming Back).